natural ingredients, Earth Wise touts some pretty amazing benefits too! 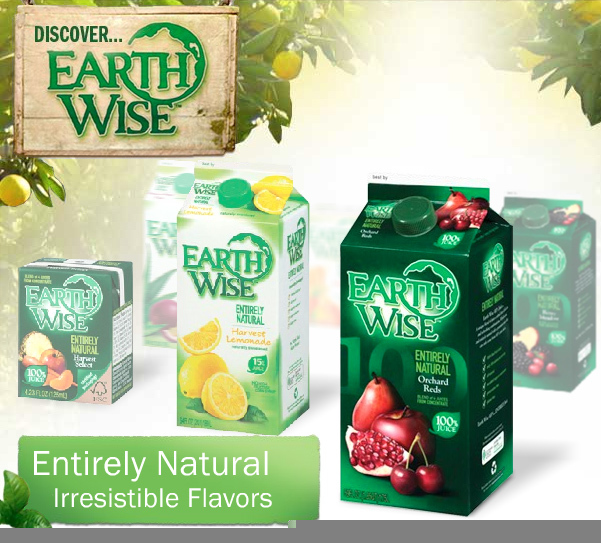 Earth Wise contains only natural ingredients and high-quality concentrated juices, leaving out other stuff like high-fructose corn syrup, additives and preservatives. Earth Wise’s packaging is made from materials that are intended to be recycled after use. Most municipalities participate in these recycling programs. Earth Wise is a great choice for people of all ages (and the planet too!). Whether in the fridge or on the go, Earth Wise premium fruit juice beverages are completely refreshing, unbelievably delicious and contain real fruit juice. All Earth Wise products are made from the simplest ingredients and contain no high-fructose corn syrup or gluten. Earth Wise believes the only imprint that matters should be the one on your taste buds. All Rights Reserved, © 2009 Johanna Foods, Inc.